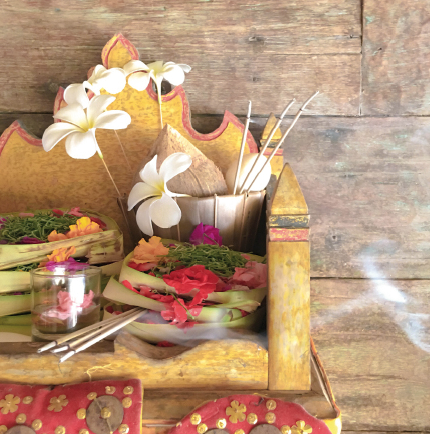 A pelangkiran is a small wooden temple, usually suspended on the wall, for Hindus to pray and make offerings at, located in every room of one’s house. Pelangkiran, derived from the word “Langkir” means a place adored. But do you know the meaning and function of the pelangkiran? Based on the Lontar Aji Maya Sandhi story, when people are sleeping, Kanda Pat – a spirit from within comes out of the human body and wanders, sitting on the chest, abdomen, arms and so on, thus disturbing one’s sleep. Therefore there needs to be a pelangkiran to house this spirit which enables them to carry out their duties as a watchman. When implemented, people will sleep peacefully and soundly because they are being guarded from all forms of evil spirits. Pelangkirans have many functions depending on the location in the house. 1. For children from birth to 3 months, it is hung over the crib. It is Stana Sanghyang Kumara, son of Lord Shiva, assigned as protector of the baby. 2. In the kitchen, Stana of Lord Brahma, the creator. 3. For a well or tap water, to Lord Vishnu, preserver. 4. In a market, to Bhatari Dewa Ayu Melanting, goddess of economic activity. 5. In a shop or business premises, Stana to Bhatara Sri Sedana as the giver of prosperity to all people. 6. At the office, for Bhagawan Panyarikan or Saraswati, goddess of learning, knowlede and wisdom. Offerings are called banten in Bahasa Bali, meaning tribute, obligation or gift, possibly dervied from the word enten, which means to wake up or be conscious. Offerings are gifts. They are a means of giving something back. But of course, gifts obligate the recipient, and so the system creates mutual obligations and favours, even between humans and spirits. With offerings to the demons, however, the offeror does not expect a gift in return, just the favour that the demons will go away.